This week for Preschool Lab, we talked about oceans. Specifically, we talked about ocean animals. This was a really fun theme and the kids enjoyed it. I realized that the books I picked out this week were not really stories and, while they worked just fine and I love showing the kids real pictures, if I was to plan this one over again I would probably include a story for one of the books (maybe A House for Hermit Crab by Eric Carle or Swimmy by Leo Lionni). One of the nice things about this theme is that there is a LOT of material to choose from! Always include a book display! Word Cloud: What lives in an ocean? We started by making a word cloud of ocean animals. I asked the kids what lives in an ocean and wrote down what they said. This is a great activity for showing that printed words have meaning, for introducing lots of new vocabulary words to the group, and for validating each child's own knowledge. Looking back, I should have had a familiar song to bring the group back together after this time of talking out. My kids were not ready to listen yet. Maybe if I had started with the word cloud and then gone into our opening song, it would have worked better. Book: Life in an Ocean by Carol Lindeen. This nonfiction book shows photos of oceans and some of the animals that live in the ocean. As part of the Pebble Plus series, you know it has big, colorful pictures, which are great for sharing with a group. Felt Activity: Ocean Animals. I passed out pictures of ocean animals and the kids brought them up to populate our "ocean" as I called the animal they had. This activity helps kids practice listening and following directions. Book: Ocean Counting by Janet Lawler. This is another book with lots of great animals to see in the pictures. Reading this book introduces children to lots of new vocabulary words and they can practice counting with you. Book: Gooey Jellyfish by Natalie Lunis. I didn't read the text of this book, but I showed the kids the first few pages of the book and we talked about what jellyfish looked like. I wanted to make sure to include a jellyfish book since I had a jellyfish station. We talked about how jellyfish are see-through and they have tentacles and come in many different colors. Closing Song & Station Intro: Do You Know What Time It Is? We sang our closing song and then I asked them to freeze for one minute while I explained the stations we had to offer. Then they were allowed to visit whichever stations they wanted. Jellyfish. I put out supplies for them to make this jellyfish collage found on Juggling With Kids. Instead of using contact paper, I used wax paper and pre-cut the jellyfish bells and taped two together with one piece of tape at the top. This was easier for the kids to manipulate. 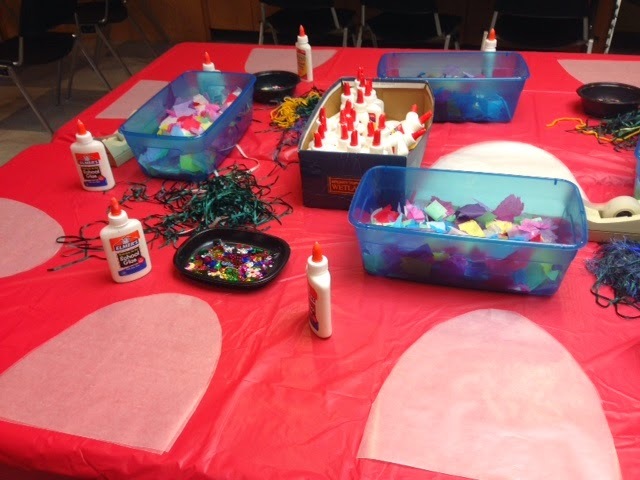 I set out all kinds of decorate-y stuff (sequins, pieces of tissue paper, and ribbons for tentacles) and they glued it onto the bottom shape and then pressed the top shape down and the glue held the pieces together. This was easy for the kids to do and they came away with a neat-looking jellyfish. Shells. We had decorative shells in our craft cupboard (you can get them at any craft store or ask friends to bring you some home from the beach). 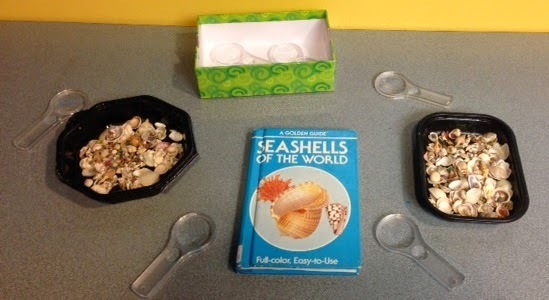 I put those out with magnifying glasses and a book on shell identification. Anything with magnifying glasses is a big hit! Ocean Animal Cards. I found a bunch of pictures of ocean animals and laminated them to make cards that the kids could look at or sort. Mostly, they liked looking at the pictures and telling what animals they were (vocabulary!) but if you have a less-chaotic group than I had they might enjoy spending some time together sorting. I wrote the names of the animals on the back. Toys & Felt Board. 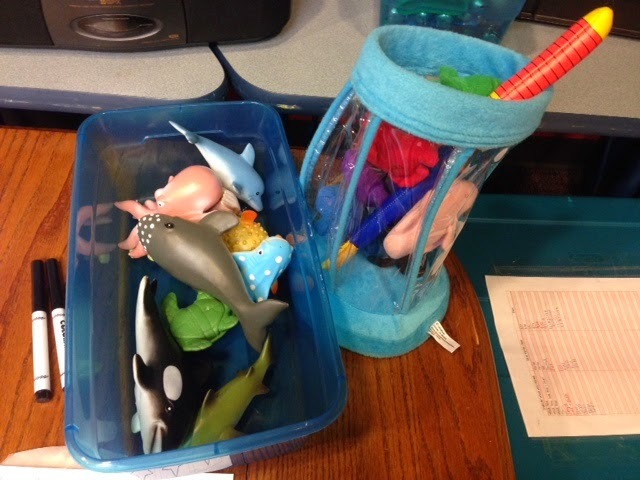 We have some ocean animal toys in our Toddler Time toy box and a velcro fishing set. I put those out and kids enjoyed playing with them. I also put our ocean animal felt set out on the felt board and they could play with those, too. Of course, I put up a display of ocean books and take-home packets for them to pick up. Salt water experiment from Brilliant Beginnings Preschool to demonstrate that the ocean is full of salt water. Octopus ink demonstration from Learn Play Imagine. Check out the Ocean Reading Adventure Pack from Reading Rockets for more fun activities and take-home ideas!